Few political observers will be surprised that the correlation between presidential and Senate results has been increasing over the last few presidential election cycles. That is, during a presidential election year, the Senate race in state A has increasingly tended to have a similar outcome to the presidential result in state A. Other analysts have noted the growing relationship between the two variables, such as National Journal, which produced a great infographic examining the 2000 to 2012 elections. But what is surprising is that, despite increasingly high levels of polarization in American politics, 2012 was by no means a record-setting year for correlation between presidential and Senate results: The correlation in 2012 was .78, well short of the record set in 1916, .92. In fact, eight presidential cycles had higher correlations than 2012, suggesting that there have been plenty of cycles where voters were even more likely to cast straight-ticket ballots than in recent times, at least for president and senator. Chart 1 lays out the correlations between the two-party vote for president and Senate in each presidential cycle from 1916 to 2012. This article will explore the relationship between contemporaneous presidential and Senate contests going back to 1916, the first presidential election to take place after the passage of the 17th Amendment, which began the era of universal popular voting for Senate races. It will also serve as a historical review of these notable Senate cycles that helps explain the correlations. Throughout the piece, all percentages and margins will refer to the two-party vote, and charts and some of the discussion will tend to use the Democratic percentages for presidential and Senate voting as it’s customary in most political science literature. The analysis uses the two-party vote for the presidential and Senate results, and removes from consideration any contest with the following situations: a major-party Senate candidate faced no major-party opposition (e.g. a Democrat running in Mississippi in 1936), a third-party or independent candidate won the Senate race, or a third-party or independent candidate won the presidential race in the state in question. The results in these cases could obviously skew a correlation analysis. The set of observations also excludes any simultaneous special Senate contests in that sought to fill out a short-term Senate vacancy through the coming January (or March before the 20th Amendment). After excluding the 79 races that meet those qualifications, there are 788 observations to consider in the 25 presidential cycles between 1916 and 2012. At times, the excluded observations will be mentioned or included in other forms of analysis besides correlation. Given the effect of presidential coattails that shows up in most elections, it’s unsurprising that there’s a relatively solid positive correlation of .64 between the two variables throughout this entire period. Chart 2 below lays out a scatter plot and best-fit line for all 788 observations. With that positive relationship established, let’s move to examining some cycles in more detail. 1916-1920: The golden age of straight-ticket voting? These two cycles featured very different styles of presidential races — one was very close, the other a huge blowout — but the Senate races in most states followed the top ballot line’s lead. 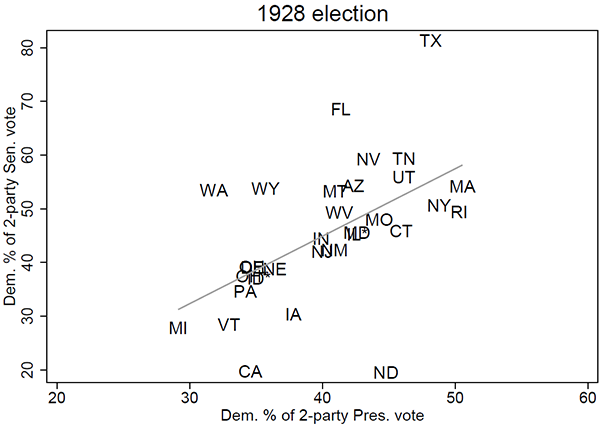 The correlation between presidential and Senate voting was .92 in 1916 and .89 in 1920, resulting in the highest two-cycle average of .90 (with rounding). The 1916 presidential election between incumbent Democrat Woodrow Wilson and Republican Charles Evans Hughes was one of the closest in U.S. history, at least in the Electoral College. Wilson’s slim 3,773 margin in California proved the difference; had Hughes won the Golden State, he would have defeated Wilson despite losing the popular vote. The GOP did gain two net Senate seats despite Wilson’s victory. 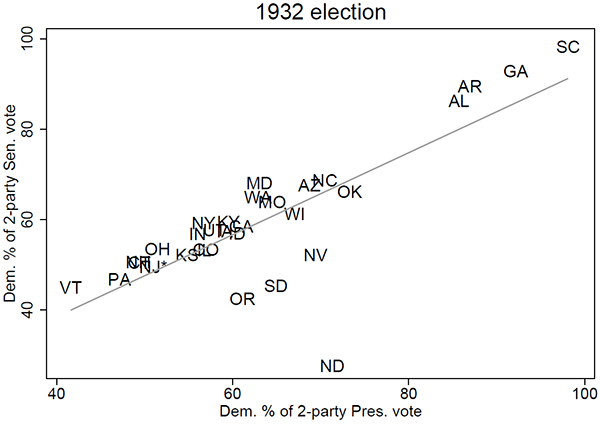 Chart 3 below lays out the presidential and Senate results by state in 1916, and it’s no wonder that 1916 saw the highest correlation, .92, between the two variables of any cycle: Of the 33 contests in question, 23 (70%) saw less than a five-point difference, positive or negative, between the Democratic presidential and senatorial two-party percentages. Much like the presidential contest, many Senate races were closely fought, with eight (23% of all contests) decided by less than five points. 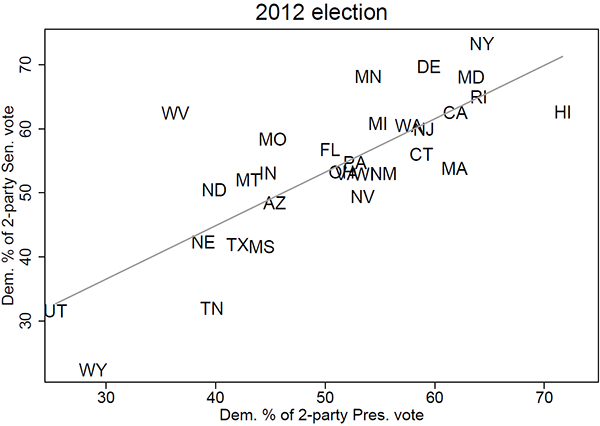 Generally, most of the races practically hug the best-fit line, showing how well a line can be drawn to fit the data. The 1920 election cycle really couldn’t have been more different from the close-run battle of 1916. Republican Warren G. Harding rode the country’s desire for what he termed as a “Return to Normalcy” to what was then the largest percentage vote haul in U.S. history (60.3% of the overall vote) in his victory over Democrat James Cox. Harding’s dominating performance was mirrored down-ticket: Republicans won 10 net seats in Congress’ upper chamber. The vote percentages for Senate reflected the presidential contest: 1920 had a correlation of .89 between the two variables, essentially tied with 1940 and 1944 for second-highest (see Table 1 earlier). Won easily by Republican Calvin Coolidge with 65.2% of the two-party vote, the 1924 election poses problems for two-party vote analysis between presidential and Senate outcomes. While it was no 1912 — mercifully for this project, that cycle featuring Republican President William Howard Taft, Democrat Woodrow Wilson, and Bull Moose candidate Teddy Roosevelt predated the 17th Amendment — 1924 saw a major third-party presence in the form of Sen. Robert La Follette Sr., a Republican running as the Progressive Party’s nominee. In many Midwestern and Pacific states, La Follette outperformed Democrat John Davis, though La Follette only carried one, his home state of Wisconsin. 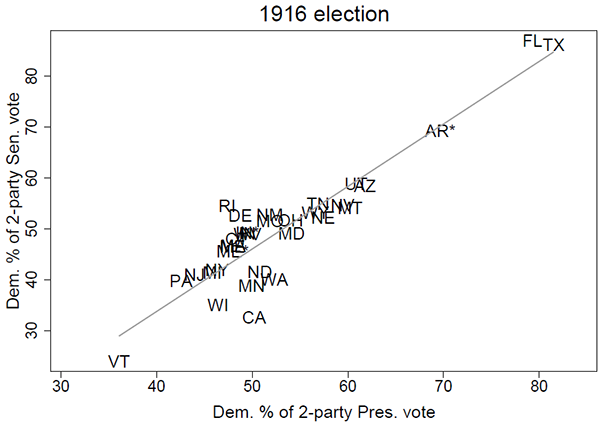 The correlation between the two-party Senate and presidential votes that year was a strong .83, but the presence of La Follette makes it less worthwhile to explore further. It is worth noting, though, that the 1924 Kentucky Senate and presidential races were amazingly identical in their two-party vote percentages: Coolidge won the presidential vote with 51.558% and Republican Frederic Sackett won the Senate race with 51.556%. Of the cases looked at in this article, this stands as the most perfectly matched pair of results. In 1928, New York Gov. Al Smith won the Democratic nomination to face off against Republican Herbert Hoover. At this point, the 1924 correlation of .83 between presidential and Senate votes stood as the lowest of the three cycles in the era of popular voting for Senate. But 1928 featured a sharp decline to just .54, the lowest correlation of any cycle from 1916 to 1960. Chart 4 lays out the 1928 result. The 1916 result (Chart 3) showed relatively strong clustering around the best-fit line, whereas 1928 had much more variance. What happened? Smith was a different kind of Democratic nominee: As we discussed last week in our piece on religion and politics, Smith was urban in background, a Catholic, and a wet (i.e. opposed to Prohibition). Those three traits didn’t play well in the rural, conservative, and dry-leaning but traditionally Democratic South, leading to Smith’s failure to carry several Southern states that had backed Democrats in presidential contests since Reconstruction and helping ensure an even uglier defeat at the hands of Republican Herbert Hoover. At the same time, however, the Democratic brand remained strong down-ticket in the South as the party easily won all five Senate elections in the old Confederacy in Florida, Mississippi, Tennessee, Texas, and Virginia even while Hoover carried all but Mississippi. Overall, Republicans had a banner year in the Senate, winning a net gain of eight seats. Franklin Roosevelt’s election ushered in the New Deal, but for presidential and Senate results, it was a return to the normalcy of the pre-Al Smith era. 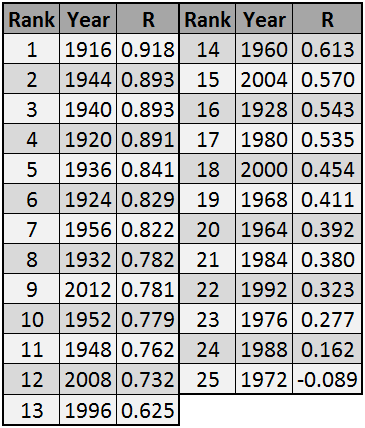 After the 1928 hiccup, 1932’s correlation was a stronger .78, though still lower than the 1916-1924 period. 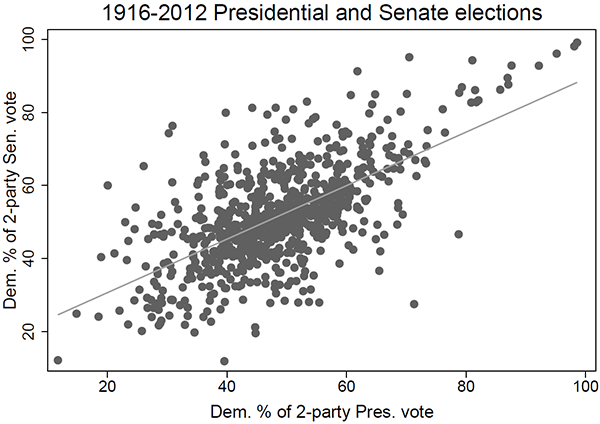 FDR’s crushing win over Hoover helped Democrats win 11 net Senate seats, but Republican Senate candidates performed well enough (relatively speaking) that they produced the outlier results that helped lead to a lower correlation, as shown in Chart 5 below. The most obvious example of this was in North Dakota, where incumbent Sen. Gerald Nye (R) won reelection with 72.5% even while Roosevelt was romping to 71.3% in the Peace Garden State. This was the third-most divergent result in the 1916-2012 period. 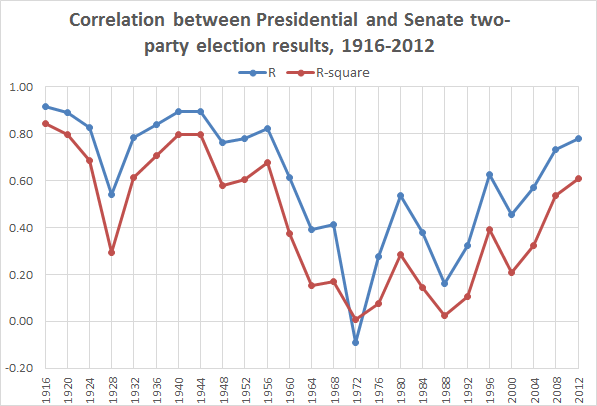 The 1936, 1940, and 1944 elections saw an uptick in correlations between presidential and Senate voting, with the latter pair’s .893 correlations making them the two highest outside of 1916. FDR’s final two election wins demonstrated notable consistency, winning with 55% and 54% in 1940 and 1944, respectively. And the Senate contests in 1940 and 1944 closely followed the presidential election’s lead: 44 of the 64 Senate contests (69%) in our list of observations had a five-point or smaller difference between the presidential and Senate Democratic two-party vote percentage. Democrats actually suffered a net loss of three seats in 1940 and one seat in 1944, in part because FDR wasn’t winning by the same gigantic margins he had in 1932 and 1936. The three presidential elections to follow FDR’s time in office also featured highly correlated presidential and Senate results. Though they weren’t on the level of 1940 and 1944, the 1948 (.76), 1952 (.78), and 1956 (.82) contests all saw strong correlations between the two variables. In 1948, Roosevelt’s successor, Harry Truman, looked like a goner if pre-election conventional wisdom was to be believed, but “Give ‘em hell” Harry won 52% of the two-party vote to defeat Republican Thomas Dewey, helping Democrats to a nine-seat net gain in the Senate. Had the traditionally Solid Democratic South been completely in Truman’s camp, it’s possible that the correlation between presidential and Senate voting in 1948 would have been higher than .76. But Strom Thurmond launched his Dixiecrat third-party bid, winning Alabama, Louisiana, Mississippi, and South Carolina in the Electoral College. Democrats won all four Senate races in these states (two in Louisiana because of a special election; Alabama had no contest), though two were unopposed. Four years later, Republicans finally broke through against the Democrats, winning a contest for the White House for the first time since 1928. However, and despite the fact that Republican Dwight Eisenhower’s two wins over Democrat Adlai Stevenson in 1952 and 1956 were not close, Republicans only managed to net two Senate seats in the first election and none in the second. That was in part a result of Republicans having to build on strong midterm performances in those classes in 1946 and 1950, when the GOP gained 12 and five seats, respectively. Up to 1960, almost every presidential election cycle saw strong correlations between the Senate and presidential election results in each state. Except for 1928, every other cycle had seen a correlation of at least .76, with seven of the 11 cycles featuring correlations of .82 or higher. While the 1960 cycle’s correlation wasn’t as weak as 1928, it did fall to .61 and was the final cycle in a long period of moderate to very strong correlations. The election was a mixed bag: Democrat John F. Kennedy won the presidency, but the GOP picked up a net gain of one seat in the Senate. No cycle between 1964 and 1992 would surpass 1928’s .54 correlation, making it a period of notably incongruous results between the top of the ticket and the Senate races going on in the same states. There is an easy explanation for this: the Solid South was no longer solidly Democratic in presidential elections but it continued to elect Democrats to the Senate (and other offices). This would be plainly obvious in 1964 as Republican Barry Goldwater swept the Deep South but Democrats won all six Senate races in the former Confederacy. Four years later, George Wallace’s performance in the South, particularly the Deep South, makes that cycle more difficult to analyze. Still, the low correlations of 1964 (.39) and 1968 (.41) only foreshadowed two cycles that would see very weak or nonexistent relationships between Senate and presidential voting in the states. Above all, the 1972 cycle stands out as a year unlike any other in this series of presidential election cycles. That year, Republican Richard Nixon overwhelmed Democrat George McGovern, winning every state except Massachusetts (and Washington, DC). The incumbent’s 61.8% vote take was the last time anyone garnered more than 60% of the two-party vote in a presidential election. Nixon’s victory, however, has often been denoted as a “lonely landslide” because Democrats in the Senate actually gained two net seats despite the trouncing of their presidential standard bearer. The correlation between the presidential and Senate two-party votes was actually negative, -.09, and showed essentially no relationship between the two variables. The unparalleled 1972 cycle is shown in Chart 6 below. A good indication of the divergent results can be seen in the dramatic differences in three Southern states: Alabama, Louisiana, and Mississippi. The Senate contests in those states featured three of the six largest differences between Senate and presidential Democratic two-party vote for the entire 1916-2012 period. In Louisiana, Democrat J. Bennett Johnston won with 74% of the two-party vote, though he did in part because former Gov. John McKeithen, another Democrat, ran as an independent and won 23% of the overall vote (Johnston won 55% of the overall vote). Meanwhile, Nixon won 70% of the Pelican State’s two-party presidential vote. But there was no third-party or independent impact in Alabama or Mississippi. In the Yellowhammer State, veteran Sen. John Sparkman (D) won reelection with 65% even while Nixon racked up 74%, and next door in the Magnolia State, long-time Sen. James Eastland (D) won 60% in the midst of Nixon running up 80% of the two-party vote. 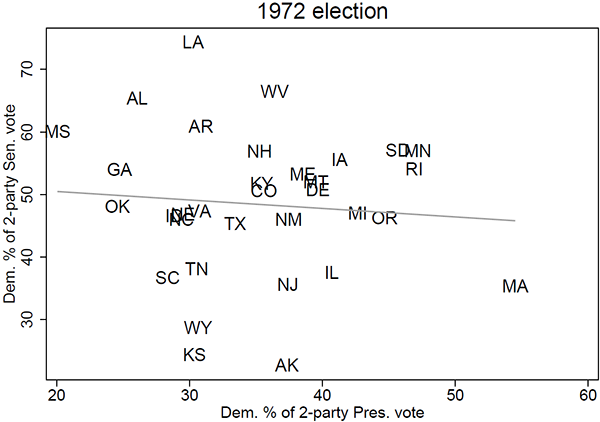 In 1976, the correlation between presidential and Senate voting was a weak .28. While that was up from 1972, the correlation did not increase as far as one might have expected given Democrat Jimmy Carter’s strength in the South. This was partly a function of the Senate class that was up in 1976, Class 1. Whereas Class 2 has 10 seats from the old Confederacy and Class 3 seven, Class 1 only has five, meaning Carter’s home-field advantage didn’t affect as many Senate races as it might have in another year. As things panned out with the 1976 election, this was particularly important because the presidential election between Carter and Republican incumbent Gerald Ford proved to be a strongly geographically divided election mainly between the South and East (Carter) and the Midwest, Interior West, and West Coast (Ford), with some exceptions (like in all things political). The performance of some Democratic Senate candidates, mostly veterans, also played a role. Sens. Quintin Burdick (D-ND), Howard Cannon (D-NV), Hubert Humphrey (D-MN), Henry “Scoop” Jackson (D-WA), and William Proxmire (D-WI) all ran 15 points or more in front of Carter, plus newcomer John Melcher (D-MT) won by 18 points while Ford carried his state by about eight points. 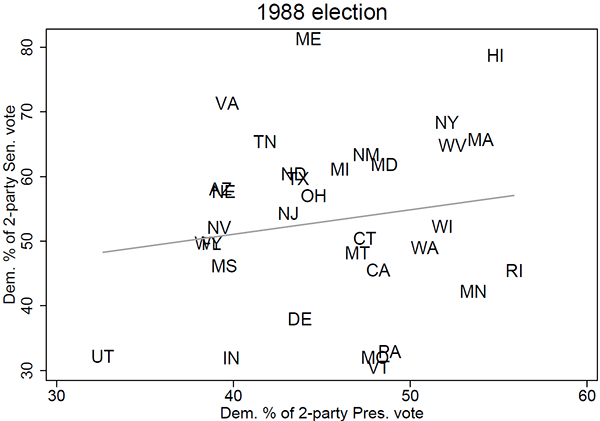 The 1980 election, with a correlation of .53, was the only cycle between 1964 and 1992 that topped .5 in correlation between presidential and Senate voting. Republican Ronald Reagan defeated Carter and the Californian’s win had giant coattails: The GOP gained 12 net seats in the Senate, defeating many long-time Democratic incumbents in the process. In fact, nine incumbent Democrats would lose Senate races that November, suggesting an obvious increase in straight-ticket voting compared to recent cycles. But Reagan’s landslide reelection saw another downturn in correlation, this time to .38, around the same level as Lyndon Johnson’s 1964 win. Notably, the 1984 election featured the Senate race with the record difference in Democratic Senate and presidential two-party vote. In Oklahoma that year, Sen. David Boren (D) won 76.4% of the vote while Walter Mondale only won 30.9%, a difference of 45.5 points. 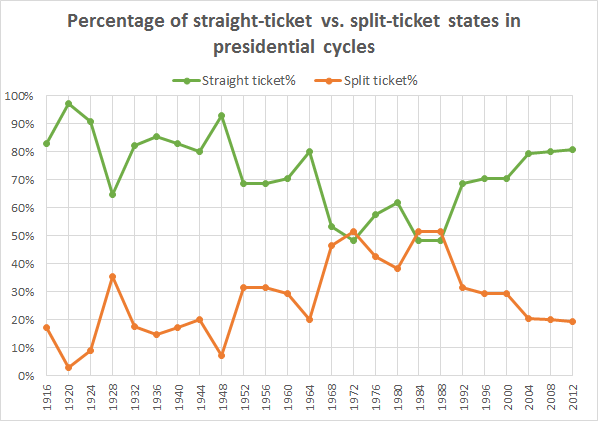 As Reagan’s win was the last real landslide the country has seen in a presidential election, it seems like an appropriate time to answer a question that arises from the data: Is there any connection between straight-ticket voting (i.e. stronger correlations) and blowout wins? The answer appears to be no: There is a correlation of .07 between the Senate-president vote correlation and two-party victory margin, which means there’s really no relationship. Like in most political circumstances, timing matters. Landslide wins like those of Harding in 1920 and FDR in 1932 and 1936 came during periods of strong correlations between presidential and Senate voting. Meanwhile, Nixon’s 1972 crushing victory managed to yield essentially no relationship between presidential and Senate voting, and LBJ and Reagan’s wins saw presidential-Senate voting correlations that were of meager strength. The 1988 election had the lowest correlation outside of the 1972 election of the entire 1916-2012 period, just .16. 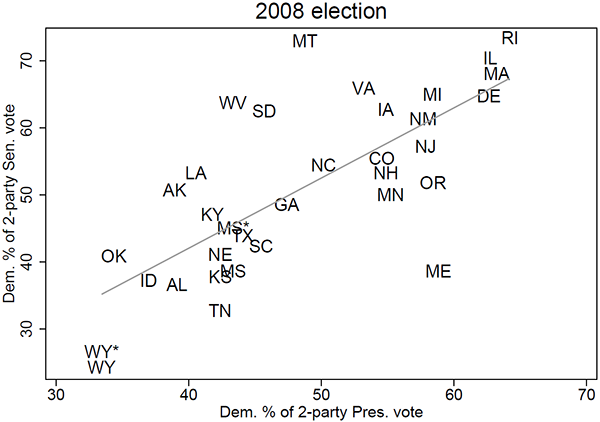 As shown in Chart 7 below, numerous states exhibited split-ticket voting habits as a number of Democratic Senate candidates ran far ahead of Michael Dukakis. In fact, Democrats had a net gain of one Senate seat in 1988. Victorious Republican nominee George H.W. Bush’s vacation home of Maine, for example, had a Senate race where Sen. George Mitchell (D) won reelection with 81% of the two-party vote while Dukakis won only 44%. In Virginia, Chuck Robb (D) picked up a seat for Democrats with 71% of the vote while Dukakis only won 40%. Two other states, Hawaii and Tennessee, also featured Democrats who ran 23 or more points ahead of Dukakis. Four years later, Bush’s 1992 loss to Democrat Bill Clinton came in an election that had a stronger but still weak .32 correlation between presidential and Senate voting. That election offers some complications for analysis due to the presence of Ross Perot, but generally speaking, it proved to be the end of an era. Bill Clinton’s reelection year saw a dramatic increase in the correlation in presidential-Senate voting, almost doubling to .63 from 1992. Just compare the 1988 result in Chart 7 to the 1996 result in Chart 8 below. While the states in the latter figure aren’t terribly crowded around the best-fit line, they are noticeably more coalesced than in Chart 7, suggesting an increase in straight-ticket voting. For all the talk about red and blue states in the 2000 to 2004 period, correlated presidential and Senate voting didn’t quite reflect it. 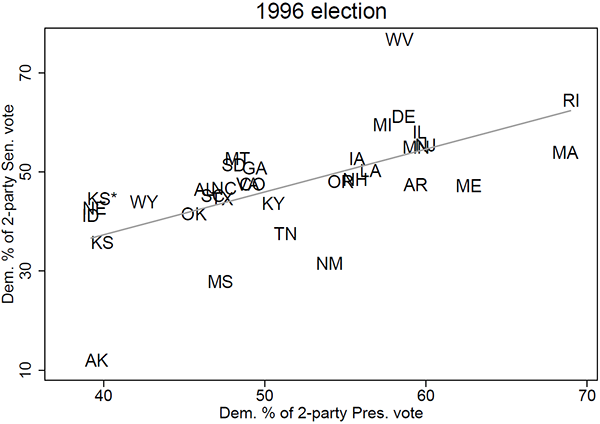 The 2000 election actually saw a decrease in correlation between presidential and Senate voting from 1996, falling to just .45. Democrats like Sens. Robert Byrd of West Virginia, Kent Conrad of North Dakota, and Zell Miller of Georgia easily won contests in states that George W. Bush carried, while Republican Sens. Lincoln Chafee of Rhode Island, Jim Jeffords of Vermont, and Olympia Snowe of Maine all easily won states than Al Gore also carried. Then again, look at that list of senators. Today, only the North Dakota and West Virginia seats are still held by the party that won them so easily in the 2000 Senate contests. In 2004, there was a slight increase in the correlation between the two variables, ticking up to a somewhat notable .57. But some senators like Chuck Grassley (R-IA) and Byron Dorgan (D-ND) far outdistanced their party standard-bearers. Grassley performed 21 points better than Bush in the Hawkeye State, though Bush narrowly carried it, while Dorgan bested Democrat John Kerry by 32 points to easily win reelection. Still, the increase in correlation and the seeming rise in polarization hinted at further changes. As the Age of Obama moves into its final quarter, we can look back on the 2008 and 2012 elections as the strongest exhibitors of correlation between presidential and Senate voting since the 1950s. In 2008, Barack Obama defeated Republican John McCain with 53.7% of the two-party vote, winning by 7.4 points. Down-ticket, Democrats had a banner day, netting eight seats. As shown in Chart 9, the presidential-Senate results showed a fairly strong positive relationship, with a correlation of .73. While there were obvious outliers, such as Sens. Susan Collins (R-ME) and Max Baucus (D-MT), most states fell in fairly close proximity to the best-fit line. Lastly, the 2012 election featured the strongest correlation between presidential and Senate voting in the last 14 presidential cycles. With a correlation of .78, the election had only five states where there was a difference of more than 10 points between the Democratic presidential and Senate voting percentages, and in all five of those states the Democratic Senate nominee ran 10 or more points ahead of Obama. As shown below in Chart 10, the principal outlier, far ahead of all others, was Sen. Joe Manchin (D-WV), who performed 26 points better than Obama in the Mountain State. Four other senators also were a part of the 10+ club: reelected Sens. Tom Carper (D-DE), Amy Klobuchar (D-MN), Claire McCaskill (D-MO), and now-Sen. Heidi Heitkamp (D-ND). There’s no denying that there has been movement back toward straight-ticket voting in recent years. Just look below at Chart 11, which lays out the percentage of states that had straight-ticket or split-ticket presidential and Senate outcomes from 1916 to 2012. If a state is counted as straight-ticket, it was won by the same party in its presidential and Senate voting. If a state is counted as split-ticket, one major party won the presidential contest in the state while the other won the Senate election. As one would expect, most years that had high correlations between presidential and Senate voting also had a large percentage of straight-ticket results. For instance, the 1916 cycle, which holds the record for the strongest correlation between presidential and Senate results, had 83% of states with Senate races vote for the same party for president and Senate. While we aren’t at the heights seen in 1920 or 1948, the 2008 and 2012 cycles broke through the 80% mark for straight-ticket president and Senate election outcomes. The correlation analysis throughout this study has sought to examine consistencies or incongruities between the vote for president and Senate in states that had Senate races in presidential cycles. Simply put, in the age of popular voting it has actually been somewhat more common for there to be a relatively strong correlation between presidential and Senate voting, with 14 of 25 cycles having correlations of .6 or higher. And given the trends in straight-ticket voting and measurements showing our polarization at an all-time high, it seems likely that we are again in an era of more consistent voting for president and Senate as well as other offices. No one should be surprised if 2016 exhibits a stronger correlation between presidential and Senate voting in each state than 2012 did, though it remains to be seen if we will reach the levels seen in 1916, 1920, or the FDR years. There may also be even higher levels of straight-ticket voting outcomes in states with Senate contests. As Republicans will be defending seven Senate seats in states that Obama won in 2008 and 2012, higher levels of straight-ticket voting could have real consequences for majority control of Congress’ upper chamber.